WAVERLY, OH– Ford Motor Company’s U.S. sales grew 14 percent in May, with cars up 9 percent, utilities up 15 percent and trucks up 18 percent. Retail sales increased 17 percent, marking the best May retail sales results since 2005. 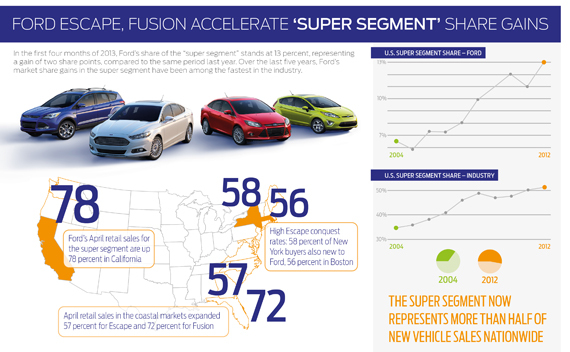 Fusion posted its best-ever May sales of 29,553 vehicles – with its strongest areas of sales growth in the western and southeastern areas of the U.S. The fuel-efficient Escape small utility posted its best-ever sales month since being introduced 13 years ago – a 26 percent increase with 29,123 vehicles sold last month. America’s best-selling pickup, the F-Series had its strongest May sales result since 2005. F-Series’ 71,604 sales in May represented a 31 percent increase versus last year and its 22nd straight monthly sales increase. In addition, Ford announces its 2013 third-quarter North American production. The company plans to build 740,000 vehicles in the third quarter, up 10 percent from the 673,000 vehicles produced in the third quarter of 2012. The third quarter plan includes the company’s recent announcement to add 40,000 vehicles from a reduced July summer shutdown and the addition of 200,000 units of annualized straight-time capacity starting in the fall of this year. Second quarter production of 800,000 vehicles is unchanged from previous guidance. Vallery Ford and Sam’s Club Save You Money! Vallery Ford is the region’s only authorized Sam’s Club Auto Program Ford dealer! If you are a Sam’s Club member, take advantage of extraordinary deals on new Ford cars, trucks, crossovers, vans, and SUVs! Many vehicles models are sold to Sam’s Club members at invoice pricing! Additionally, present your Sam’s Club membership card at the dealership for service discounts! If you would like more information about this exciting savings program, please contact us. If calling, simply ask for Jason and I’ll be glad to speak with you!